I first met artist Jef Murray over a decade ago when we were both guests at the Tolkien event The Gathering of the Fellowship in Toronto. I most recently spent some wonderful time chatting with Jef and his lovely wife Lorraine last year when we were guests at A Long-Expected Party 3 in Kentucky. In between conventions and conferences, we kept in touch. 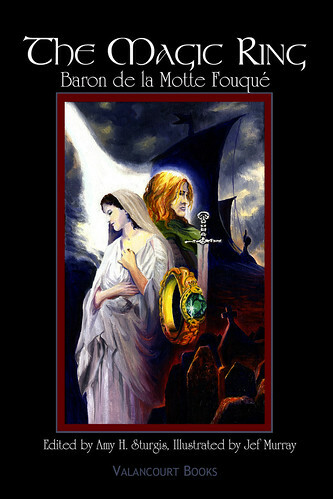 His artwork delighted me, and I was thrilled when he offered to illustrate the deluxe hardback version of my edited edition of The Magic Ring by Baron de la Motte Fouqué. He shared his breathtaking art-in-progress with me as he worked (the book contains more than forty of his gorgeous illustrations), I shared my annotated music mix for the project with him, and the experience was a true joy. If you're unfamiliar with Jef's remarkable art, do check out the website of Jef Murray Studios. I was looking forward to seeing Jef again next year in Kentucky. The news of his sudden passing saddens me greatly. He was a rare soul and a truly gifted artist, and he brought beauty to everyone who knew him. Namárië, Jef. sad news indeed. Farewell to a lovely person and a wonderful artist! I am so sorry to hear this news! Jef was a gifted artist and a really interesting and nice man. I am glad you had the opportunity to collaborate with him and become friends. This is a shock! It is a shock! I remember looking at his artwork display with you in Toronto. *hugs* This loss is very sad for everyone. Jef and Lorraine made us feel like part of the family right away at our first ALEP (2011), and greeted us like long lost best friends at AL3P. His parting was quite a blow to the entire Tolkien community. That sounds exactly like both of them! They did the same for me at AL3P. My heart goes out to everyone touched by this tragedy. As you say, the whole Tolkien community has suffered a great loss. Thank you for a beautiful memorial, Dr Amy. The ALEP family is reeling from this sudden loss. Thank *you* for commenting. He touched so many people! My heart goes out to the whole ALEP family.